We are located on Navajo Reservoir in Navajo Dam, New Mexico. Navajo Reservoir is the most popular recreational visitor destination in the area. It has upwards of 840,000 visitors every year to the Navajo Lake State Parks in both New Mexico and Colorado. So make your next getaway a Sims Marina getaway. Our Marina has all the amenities you need to enjoy a relaxing vacation. We are located just below Sims Mesa Campground. So whether you want to stay for a day, a week, or more, we have everything you need to make your stay affordable and enjoyable. Our Marina features premium fuel, bait and tackle, groceries, ice, fishing licenses, clothing, boating supplies, camping supplies, rental boats and daily slip rentals. We also offer boat and RV dry storage facilities either covered or uncovered. The reservoir area is a popular fishing destination. Fish species in the reservoir include rainbow and brown trout, kokanee salmon, northern pike, and warm water species such as large and small mouth bass, crappie, bluegill and channel catfish. 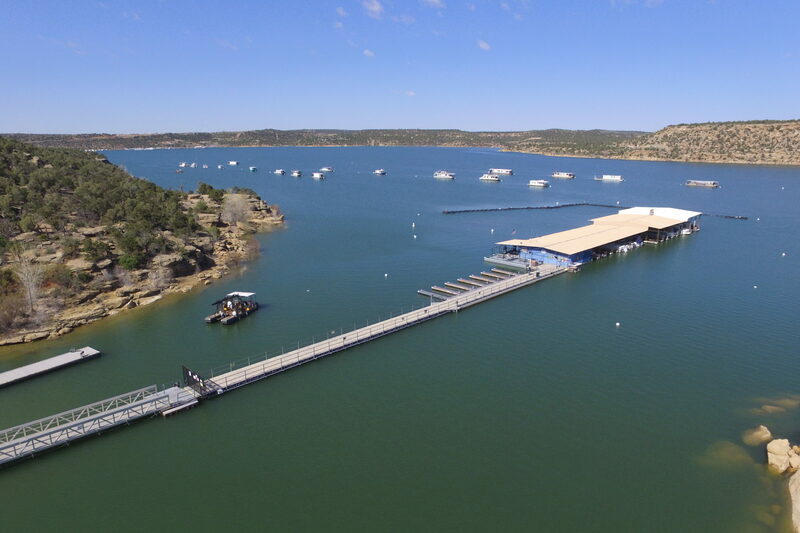 Recreational opportunities at Navajo Reservoir include motorized and non-motorized boating, water skiing, wake boarding, swimming, scuba diving, camping, picnicking, hiking, sight seeing and wildlife/nature observation. We also have developed public recreational facilities at Sims Mesa which along with the marina include a visitor center, boat launch ramp, campground, picnic areas and hiking trails. Make your reservation today for your pontoon boat or slip rental by calling 505-320-0885. Make your reservation for Sims Mesa Campground by contacting State Parks, call the number or visit the link below. Copyright © 2019 Sims Marina. All Rights Reserved. The Arcade Basic Theme by bavotasan.com.